May 16 Friday Another pleasant day, little more of a breeze, but warmer, Mer reaching 80°+ in P.M. stood 78°+ at noon. I kept busy here & there all A.M. Lena busy cooking most of A.M. & did sweeping in front room, I was over to see what could do for Mr. Rankin once or twice. 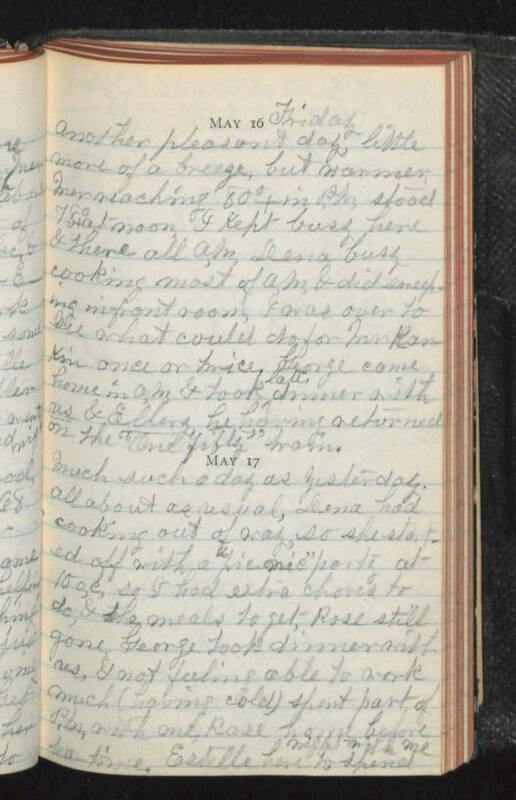 George came home in A.M. & took late dinner with us & Ellery, he having returned on the "one fifty" train. May 17 Much such a day as yesterday. All about as usual, Lena had cooking out of way, so she started off with a "picnic" party at 10 o,c, so I had extra chores to do, & the meals to get, Rose still gone George took dinner with us, & not feeling able to work much (having cold) spent part of P.M. with me, Rose home before tea-time. Estelle here to spend night with me.